Recently on our weekly grocery shopping, I came across a jar of Rogan Josh curry paste. Before I proceed further with my tale, allow me cast a bit of light on Rogan Josh. As the name suggests, Rogan meaning 'oil' in Persian and Josh meaning 'hot' refer to a tongue-tickling hot preparation of meat, originally of lamb meat that is laced with an array of flavorsome ingredients, the color lent by a special breed of kashmiri red chillies deseeded to minimize the heat quotient. In a world of innovation when scores of women are experimenting in their kitchen to cook a known dish in a variety of novel ways, variations into Rogan Josh are only but inevitable. 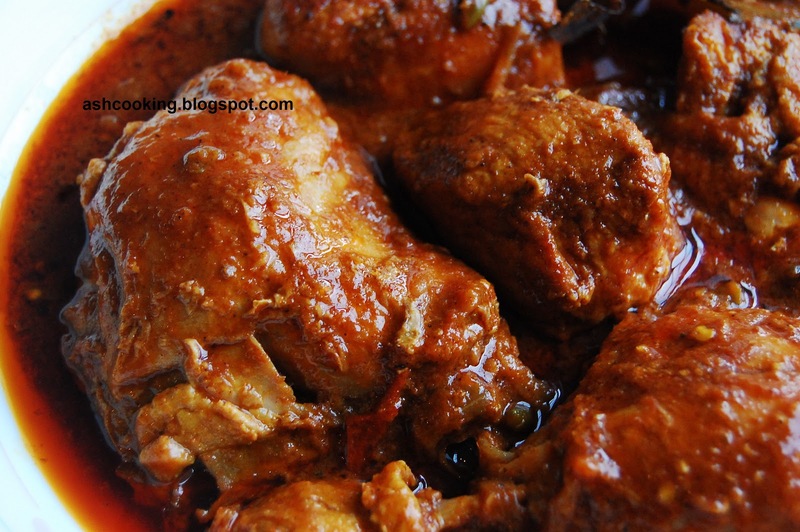 As a result, we have Rogan Josh not only of lamb, but of fish, chicken, mutton and so much as vegetables. 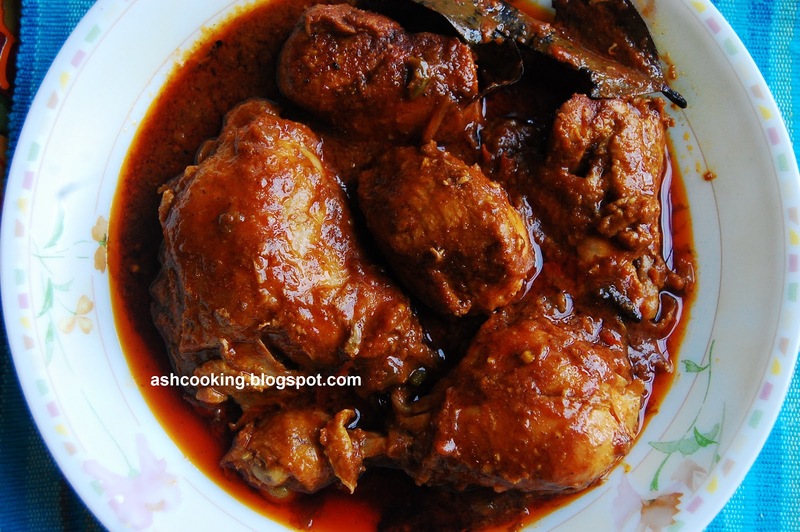 Since chicken is a staple at our home than mutton or lamb, needless to say, I have tried Rogan Josh with chicken only, until now. Although I yearned of making the dish right from a scratch, I couldn't resist myself buying a readymade curry paste when it was right within my grasp. 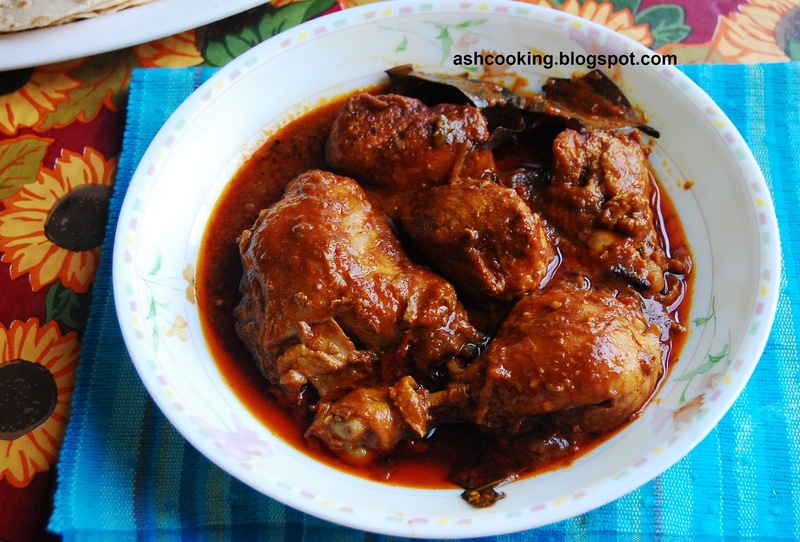 In future, I might post a recipe of Chicken Rogan Josh from the basics, but for now, if you want to follow my way, get a readymade Rogan Josh curry paste from the market (any Indian grocery of your area) and set out to a culinary venture, the end result of which will have people licking their fingers to savor the last bit of flavour. 1) Toss the chicken in a sprinkling of turmeric powder and salt. 2) Heat oil in a wok. When oil turns hot, slide in the chicken pieces and brown them a bit. Keep aside. 3) Into the same oil, add onion and fry till translucent. Add tomatoes and green chillies. Fry for 2 minutes until tomatoes soften. 4) Add ginger-garlic paste and kashmiri red mirch. Add Rogan Josh curry paste and sugar. Sauté the spices for 10 minutes. 5) Slide the chicken back into the wok. Cook covered on medium heat for 10-15 minutes. 6) Add 1 cup of hot water. Add salt and cook covered till chicken is tender and the gravy is dry. 7) Add ghee and mix in. Turn off the flame. 8) Serve hot with paratha or luchi.